Unstoppable Dogs on Three Legs. Design inspired by the herding pack at Tripawds. Check the other shop sections at left for more apparel and gifts or browse all designs here. 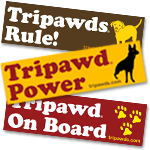 Your purchase helps support the Tripawds Community and Discussion Forums for tripods and bone cancer survivors. Three Legged Boxer Dogs Are on the Ball! Tripawds Run Circles Around Everypawdy! 3-Legged Tripawd Dogs Catch the Spirit! Three Legged Dogs Always Lead the Herd! Three Legged Mexican Muerto Dogs Have More Fun!